My name is Nelli Översti and I am now a second year IB student in JAMK. 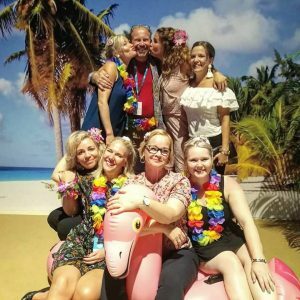 Last summer I was able to experience the real savings bank experience when working for them here in Jyväskylä. What do I mean with the savings bank experience? In Savings bank we want to create the best individual experience for the customers and therefore also for the employees. And I personally was able to get it while working fot them. Savings bank was a trustworthy and flexible employer. My needs and wants were listened and they took me as part of their community even though I was just there for the summer 2018. Here in this picture you can clearly see how well I was able to fit in this community and how nice time had all together at work but also outside of it. The pictures were taken from Säästöpankkien Kesäpäivät 2018 -event. Also this picture was taken from the same event but on the cruise. 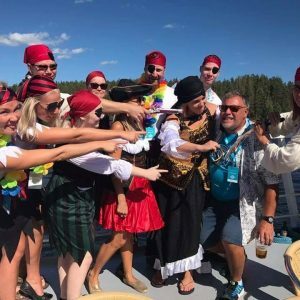 We as pirates took over the boat!